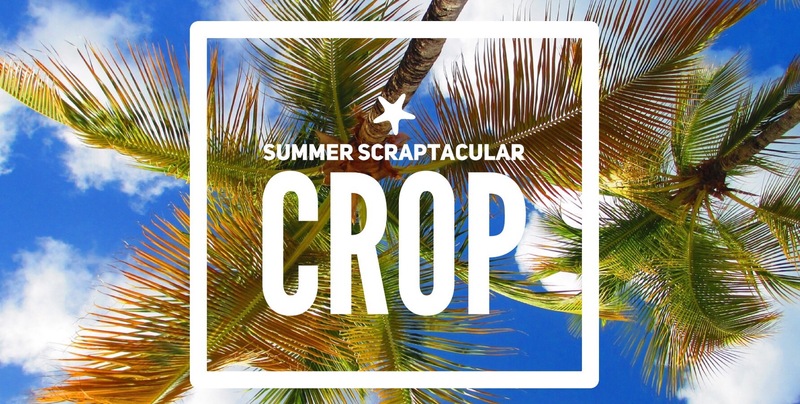 Summer is in full swing which means we are closing in on the Summer Scraptacular Crop! I couldn’t be more excited to be hosting my very first crop! The crop is nearly sold out too! So if you haven’t got your registration and payment in, DO NOT DELAY! You can find all of the details under the EVENTS tab or by clicking here. First, I wanted to let you in on a little secret! I have a super fun LUAU Party planned for us on Saturday night! I wanted to let you in on the secret, because if you come dressed for the Luau, I’ll have TEN extra DOOR PRIZE tickets for you! So don’t forget to pack your coconut bra’s and your grass skirts! There’ll be lots of games, fun surf music, and the perfect inspiration to scrap all those summer pics! Second, I will have three different workshops for you to choose from, a card class, layout class, and a mini album class! More details and prices for these classes will be announced very soon! In the meantime, you can get a sneak peak at the classes on our Facebook Event page! If you haven’t RSVP’d on the event page, go ahead and click “GOING” and make sure your notifications are turned on so we can all stay in the know and share in the excitement as the day approaches! Your HOTEL RESERVATION deadline is quickly approaching! All reservations must be received no later than July 11, 2017 to get the discounted rate of $99 per night ($121.37 after tax and resort fees). Our block of rooms is already sold out; however, they will honor our group rate until July 11, but I cannot guarantee that the resort will not be full if you wait until July 11. Reservations may be made by calling (877) 814-7316 and asking for the Brandi’s Scrapbook Weekend Room Block. This toll free number is specific to our group. A major credit card will be required upon reserving individual rooms and a seven (7) day cancellation period would apply, meaning an attendee cancelling their reservation within seven (7) days of arrival will be charged one nights lodging at the group rate. Over the next few weeks I will be working on our classes, getting your kits put together, as well as the games and prizes! It’s all coming together and I can’t wait! Let me know if you have any questions, and spread the word with your friends! We still have a few spots left, and trust me, no one will want to miss this one!! Previous Cutting Guide Sale… YES PLEASE!